Round Robin: What Have You Got on Your Head? River Song: What in the name of sanity have you got on your head? The Doctor: It's a fez. I wear a fez now. Fezzes are cool. 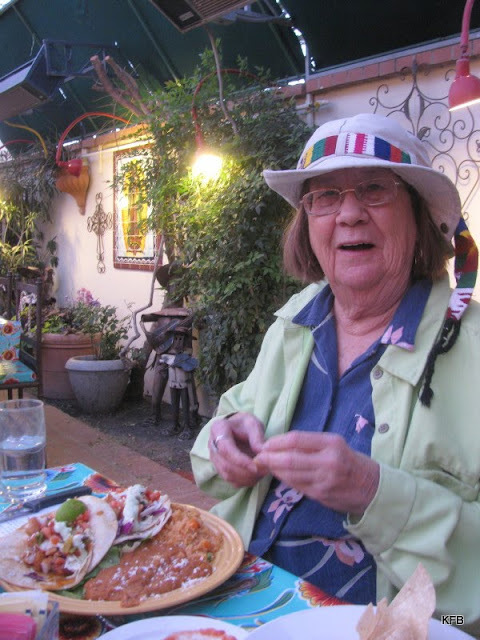 Joyce T. at El Charro Cafe in November. 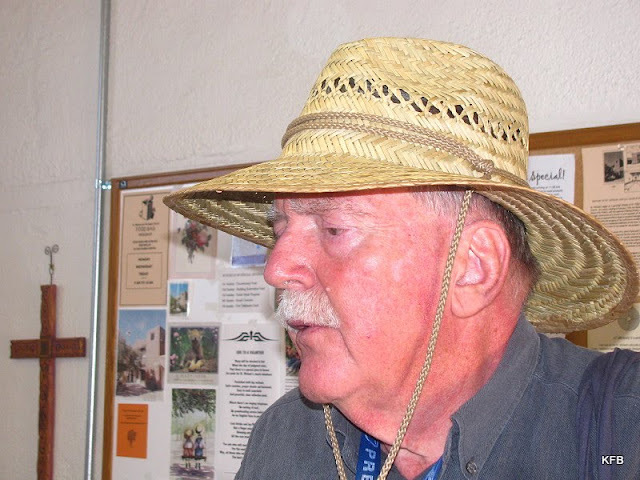 Jon R. often wears a sun hat when he's out and about. 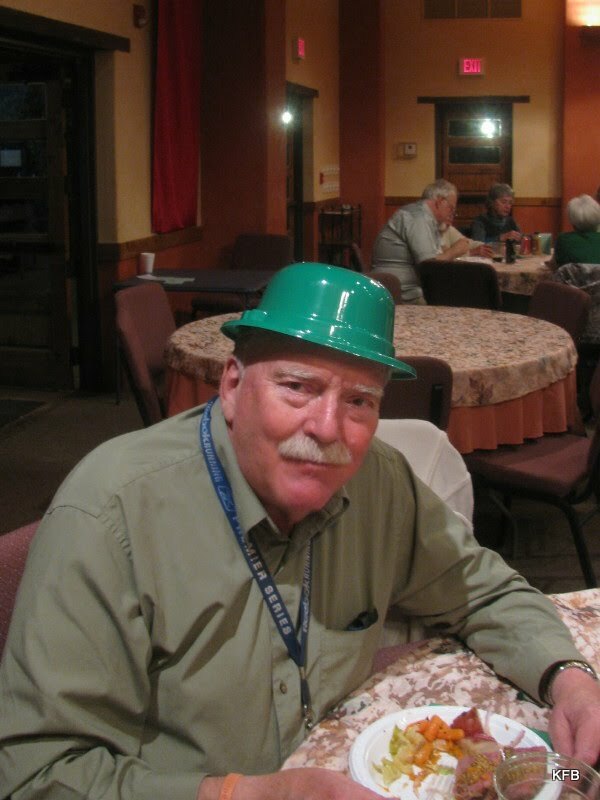 Jon wears his green plastic "Irish" bowler to the St. Patrick's Day dinner at St. Michael's. 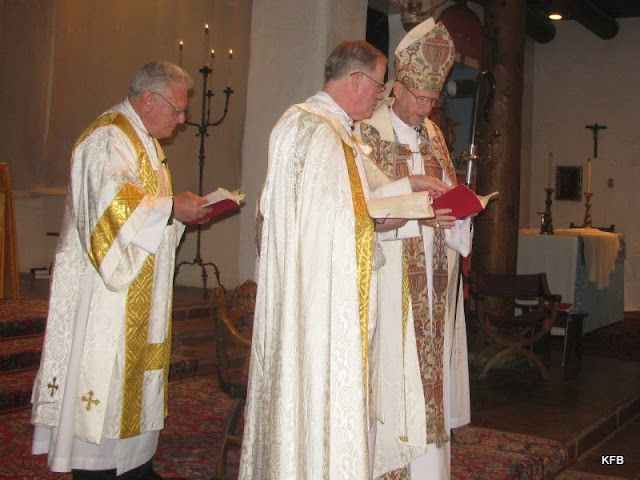 Bishop Kirk Smith in the traditional mitre. No need to take off the camo hats while eating lunch! And it's not too late to post your own hat shots! I meant to post this last night, but my life is crammed with distractions right now and things fall by the wayside. I'll give you an overview now, and double back later with pictures and tweaks. With my new temp job across town turning out to be a lengthy commute, I've had a bit of trouble this past week getting in much work at church. After a Saturday morning vestry meeting this weekend, I intended to go back after lunch and get a few good hours in. A light-hearted venue for serious softball. But it was Saturday afternoon and the weather was nice, and it seemed better to get the dog-walking in well before sunset approached--for a change. 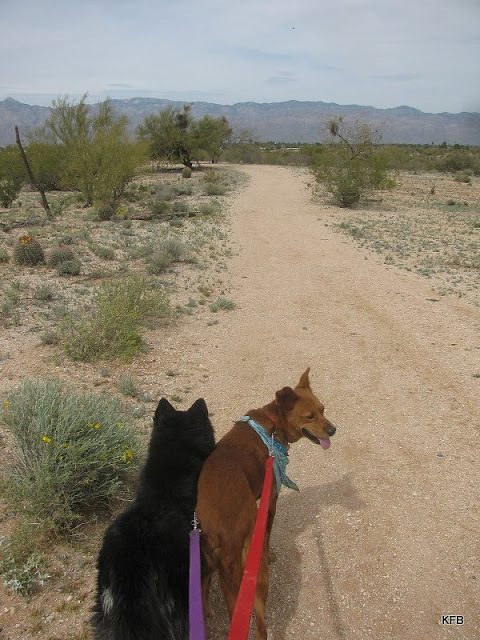 So the dogs and I headed for Tucson's Abraham Lincoln Park, which was recommended online as a good on-leash destination. 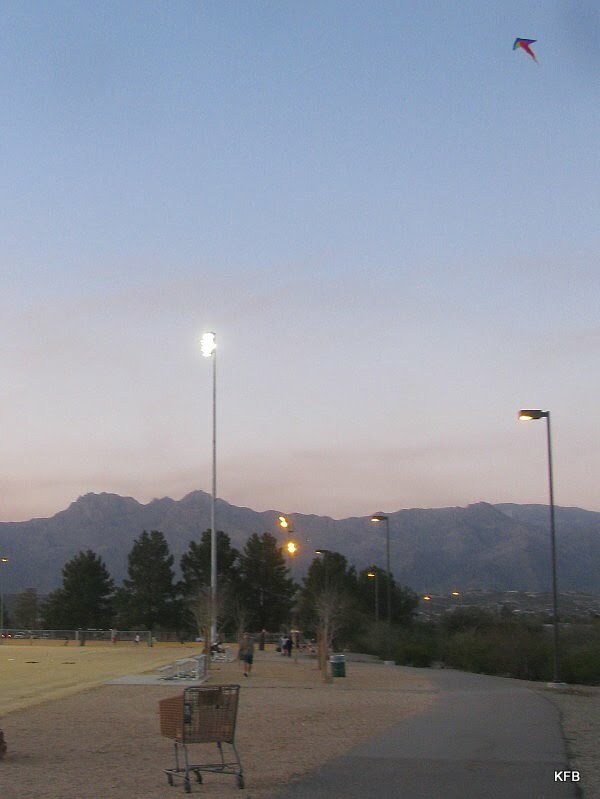 First we walked to and around a large oval track bordering a couple of baseball fields. 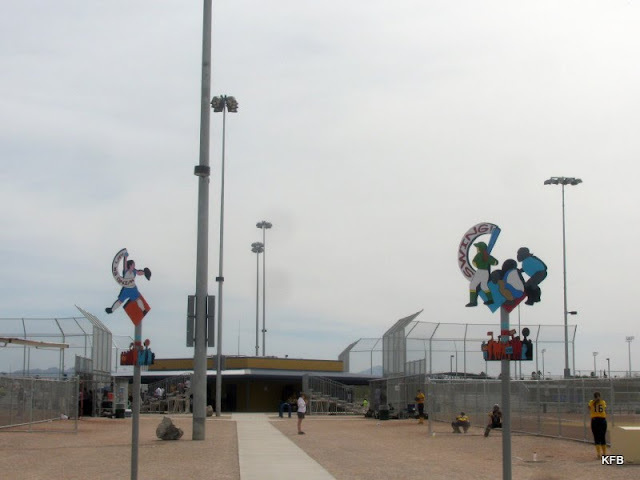 Then we did the same around a larger oval enclosing four softball fields, in two of which some college-age women, probably including the University of Arizona softball team, were having spring training. From there we followed another path to a dead-end past a gazebo, and backtracked to a hiking trail. 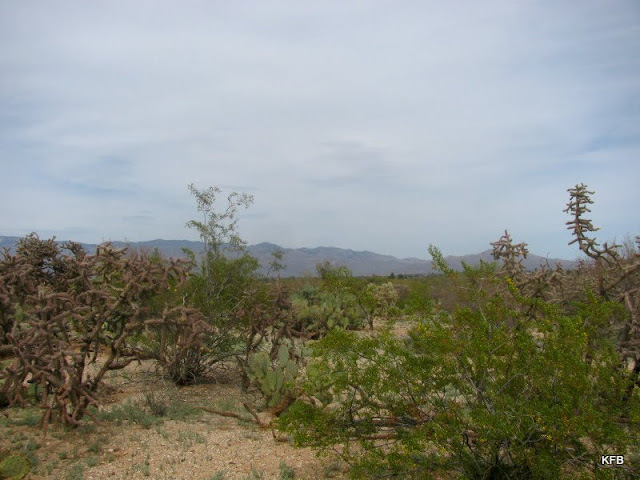 The online listing mentioned a .6 mile nature trail, but this was not that. I proceeded to get lost in a maze of desert trails, and ended up with a high school campus and a fairly steep ridge of desert between us and the softball players. The parked car was even farther away. My little dog-walking expedition turned into an hour and a half of hiking about, some of it rather strenuous. Good! But it ate up a chunk of my afternoon. 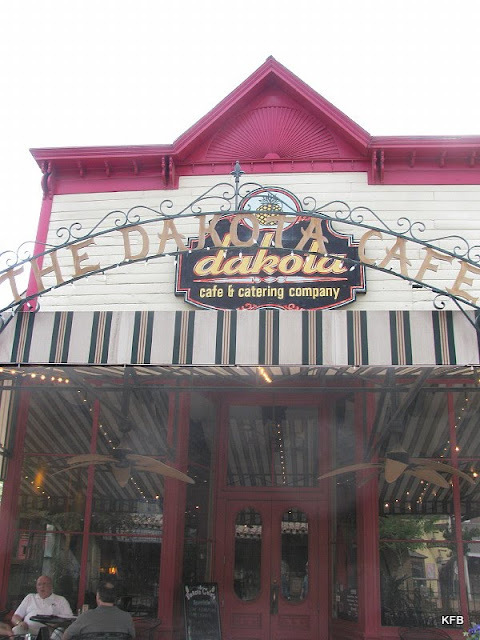 The Dakota Cafe in Trail Dust Town. Dogs allowed (outside). 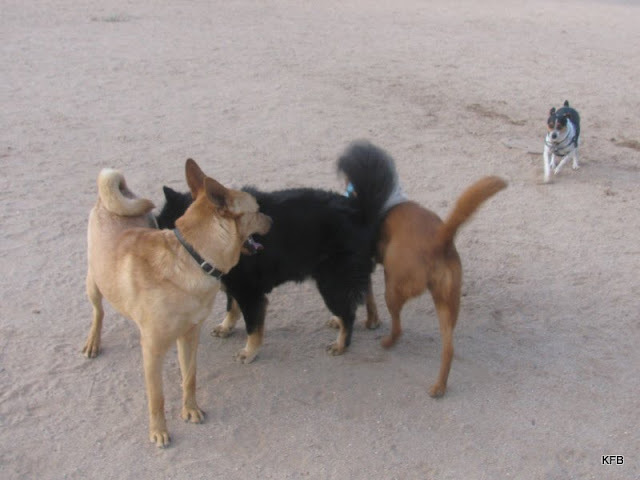 Did I then drop off the dogs and go virtuously on to work? I did not. 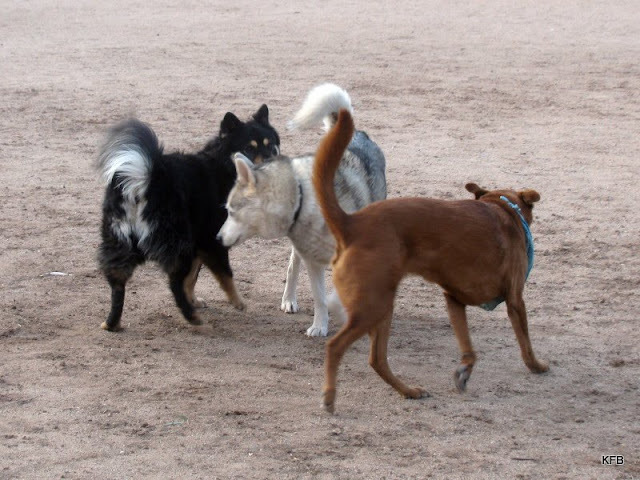 The same website that recommended Lincoln Park also mentioned a restaurant in Trail Dust Town where pets were allowed at the outside tables I decided to check it out, without the dogs. 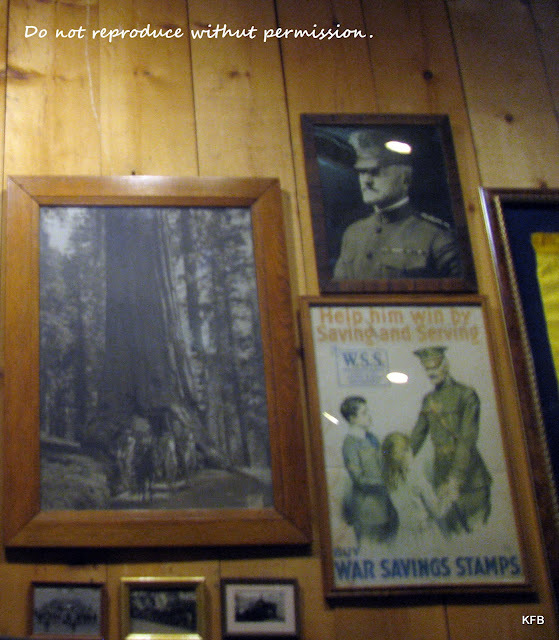 I ended up spending another chunk of afternoon at Trail Dust Town, eating a truly marvelous salad at The Dakota Cafe and chatting with an archivist at the Museum of the Horse Soldier, which I'd never visited before. Bad photo of a few exhibits at the Museum of the Horse Soldier. Do not reproduce. The museum used to close at 5 PM, right about the time most people start heading to Trail Dust Town to eat at Pinnacle Peak Steakhouse, ride the little train and watch a Wild West stunt show. But now the museum is open from 11 AM until 8 PM, with a paltry $3.00 admission fee. They've enclosed their roof, upgraded their exhibits and are about to reopen an entire roomful of exhibits. I'll have to stop by again. 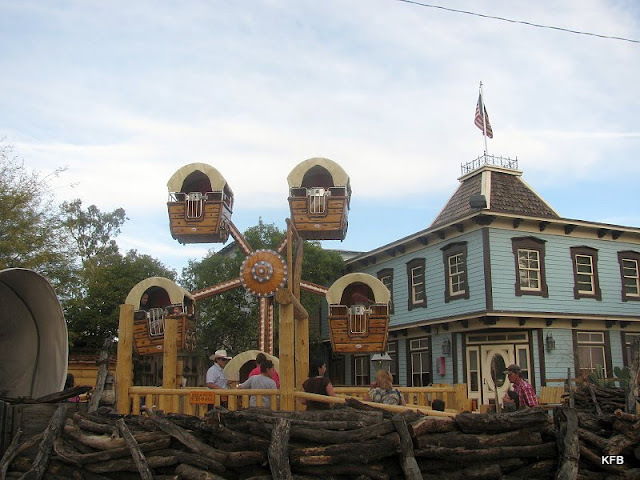 What could be more authentically Old West than a covered wagon Ferris Wheel? 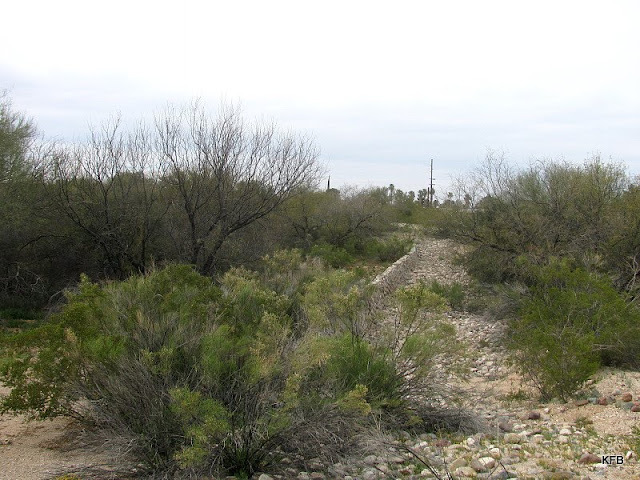 After that I took a few more pictures around Trail Dust Town. Then, and only then, I headed over to church and got in perhaps an hour and a half of work. Better than nothing, I suppose. But here's the thing. As you can probably guess from my last few postings, I'm a bit stressed out right now. My brother is still in the midst of medical and financial issues a thousand miles away, and somehow counting on me to solve them for him, talking to doctors and social workers, gathering papers that are currently locked up in his rehab facility somewhere, filling out forms and maybe even making his missing house key reappear out of thin air. I'm not quite done settling my friend Jan's estate, my efforts to lose weight are getting more and more time-consuming, I have other ongoing obligations to my church (as a parishioner and volunteer) and to two friends, and now I'm working two jobs. I need a vacation! So I guess I just took one, for about two hours. I don't remember why my friend Sara wanted to experiment with becoming microscopically small; but she did, and I helped her. Don't ask me how or why. Afterward I left her apartment (Sara doesn't live in an apartment), with her still invisible. I must have dropped the key to her apartment somewhere as I left, without which she could not be restored. I searched and felt quite guilty. Eventually I found it in a hallway, under a chair. But I didn't make it back there. Instead I was sitting with some people on a lawn at something that looked like a tableau of Americana. It turned out to be a tableau of Americana, for a tv show. They let us stay because we fit right in, I guess. "All I can come up with is Dawn," I said, "and I know that's not right." "Dawn is a Buffy character." I struggled to come up with this name I really should remember, putting my whole body into the effort. This was a mistake, as I discovered when my dead friend Tracy turned up. "Am I dead?" I asked her. I started shouting, Let me go back! Let me go back! There was no breath behind the words, no external sound. I kept shouting until I managed to produce an audible squeak of desperation and panic. I was alive again. I took a breath. And I woke up. Okay, it was just one dream, just one stupid, awful dream. I didn't belittle a friend, I'm not missing a key (metaphorical or otherwise), and I am most evidently alive. But it's been many hours since then, and I'm sitting typing this when I really should be asleep. I do have sleep apnea. John has seen me stop breathing. Is that what happened this morning? Probably not. More likely it was an anxiety dream about taking care of myself and meeting my obligations to others, and what if I fail? Do I get another chance? 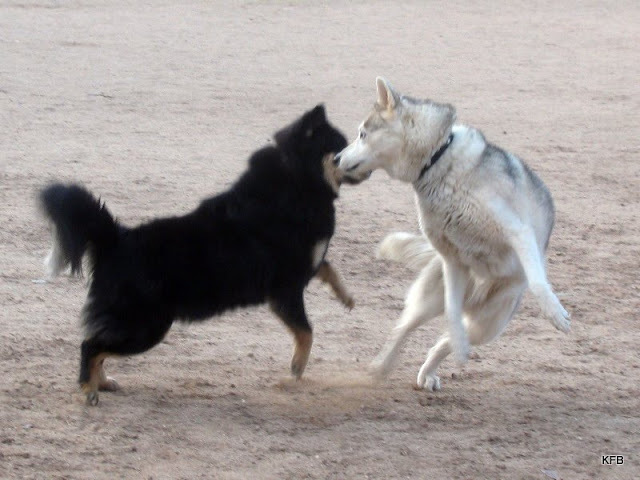 For this week's Round Robin Photo Challenge: Play, I asked to see someone playing, based on any definition of the word "play" you care to photograph. 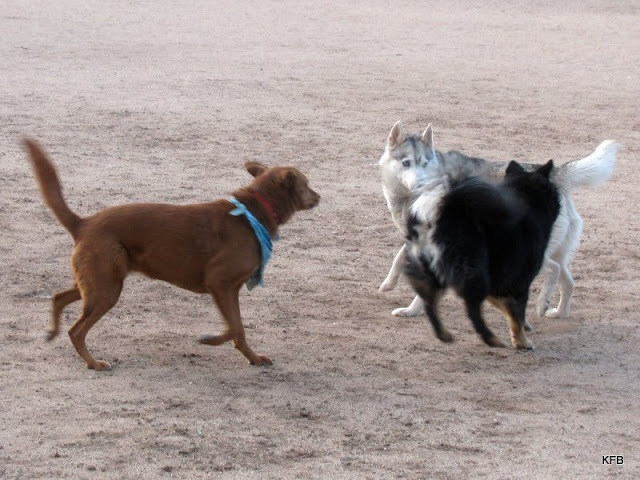 I've been taking the dogs for long walks recently, in city parks and around the neighborhood; so I ended up with pictures of dogs playing in the park. Oh, and people, but they weren't as interesting to photograph! In case you can't tell, the tiny olive drab figure behind the shopping cart is the operator of the kite. As for the soccer players, well, I don't recall hearing many screams of delight. Okay, I'm probably not being fair. 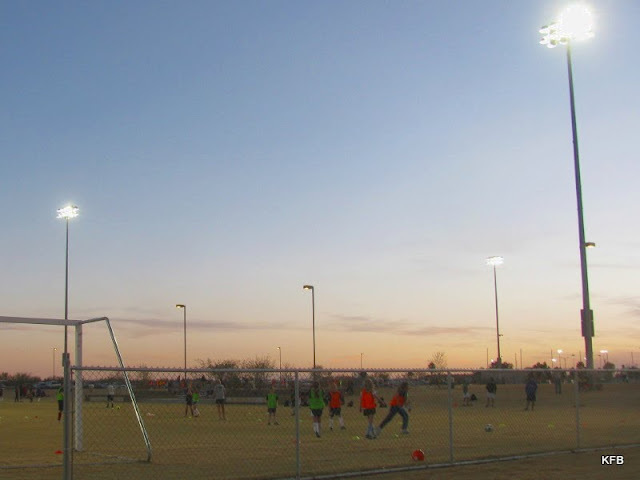 I've never been a dog, and I've never been on a soccer team that played in a park at dusk. Who am I to judge? But the dogs' photos are definitely better than the human ones!